Dynamix Host Review 2019: Is Dynamix Host a Good Hosting? With a presence in strategic locations all over France, and a world-class Tier IV data center, Dynamix Host provides almost unrivaled server technology and network infrastructure for their French clientele. You will be able to choose from their wide range of web hosting as well as powerful VPS and dedicated server solutions. Dynamix Host is a French hosting provider that has been providing a range of hosting products and services since 2005. They are both a direct provider as well as an outsourcer of server hosting products. 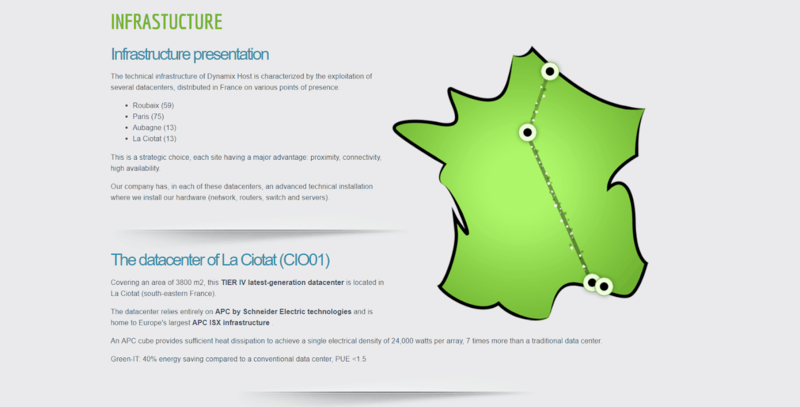 Their headquarters are based in Aubagne, France and they operate a world-class Tier IV data center facility in La Ciotat with a presence in Roubaix, Paris, and Aubagne. Sticking to just the most notable features, they provide fully functional Webmail with POP/IMAP support. All of the most important software frameworks or features are also either installed or supported such as PHP, Perl, Cron, etc. as well as some performance enhancers like Zen Optimizer and ionCube Loader. For web hosting, you have access to the Plesk control panel. It features install scripts for CMSs, FTP management, and multiple logging and website statistic tools. With VPS and dedicated servers, you get the decent easyWeb panel but you can upgrade to Plesk Onyx which is more powerful and provides multi-domain/reseller functionality. Their dedicated servers make use of Dell servers with top-end hardware like Intel Bi Xeon Quad Core processors, DDR3 ECC RAM, SSD hard drives, and RAID redundancy with hot swap drives. Although they don’t offer any Windows hosting, you can choose a number of Linux distributions. Unfortunately, though, they don’t offer any pre-installed CMS hosting, so you’ll need to do some setup work yourself. However, this shouldn’t be too hard with Plesk and their excellent support. Unfortunately, none of the plans include your domain cost and you also need to separately pay for your domain privacy. Both VPS and dedicated server plans come with an installation fee, with the VPS fee minimal and the dedicated server fee quite large. Strangely enough, you also need to pay for PHP/MySQL installation for VPS and dedicated server which seems a bit unfair. All of their plans come with flexible billing terms that include monthly, quarterly, semi-annual, and annual billing with tiered discounts. Although you get plenty of features and resources for free too, the paid extras mean your hosting can become quite costly, especially for VPS and dedicated servers. They also provide a free control panel with all products, but you can upgrade your VPS and dedicated server panel at an extra cost to Plesk Onyx. Dynamix Host provides 24/7 technical support services with all of their hosting, however, issues are only handled via a ticketing system. Phone lines exist solely for emergencies and you’ll be moved to a ticket once your case has been opened. They also claim that they monitor all of their servers and products on a 24/7 basis. For self-help, you can refer to their FAQ, knowledge base, and help forum. The knowledge base isn’t extensive by any means, but it covers some important topics. They guarantee intervention times of under two hours and recovery of under four hours. With a tier four data center, network infrastructure all over France, powerful hardware, and software as well as a great selection of plans, Dynamix Host is a competitor for one of the best hosting providers in France. Check out Dynamix Host’s web hosting options today! Wondering how Dynamix Host stacks up against other Web Hosting companies? Enter any other Web Hosting company and we will give you a side-by-side comparison.